Many expats and travelers enjoy wandering around in foreign markets to give them a feel for the culture of the country and discover treasures to buy. I trust you’ve taken careful notes and remember my post here of some months ago about my shopping excursion in the sprawling Makola Market in Accra, Ghana, West Africa and you’ll remember all the wondrous things that can be procured in its many maloderous alleys (thunderstones, dried shrimp, fabric, beads, deep-fried turkey tails, etc.). 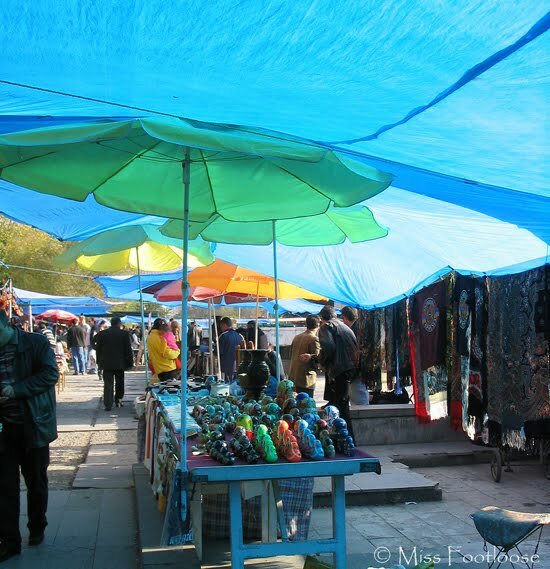 This time I want to take you along on a trip to the Vernissage, a fabulous flea market in Yerevan, the capital of Armenia, a small country in the Caucasus Mountains. It is a market of a totally different character, which is not surprising as it is located on a different continent and has a different cultural flavor. I must apologize for not having an amusing or scary story to offer along the way, but perhaps the photos will make up for it. The Vernissage is much more than an ordinary flea market. You can find new things and old things both, junk and real art, fakes and antiques and treasures of all kinds. Among the old items you’ll find out-of-date electronics; spare parts from or for equipment or instruments your great-grandfather might have used; sepia photographs of ancient ancestors dead and forgotten; archaic medical and dental instruments resembling dangerous torture devices; vintage Soviet coins and memorabilia; and leftover lab chemicals as you can see on the photo below. New merchandise include arts and craft items, souvenirs, socks and sweaters, puppies with bows on their heads, glasses and dishes. The ones below are all blue because, you guessed it, they’re underneath a blue umbrella. Delicate teacups, gold-decorated teapots, fancy glassware. Little old ladies wander around in slippers selling pastries or beautifully crocheted thingies your great-grandmother used to put over the back and arms of chairs. Sadly we have no use for those in our contemporary houses. Carpets. Old ones, new ones, good ones, not so good ones. Need some art for your walls or shelves? Paintings, carvings, sculptures, lots of stuff. And of course who can walk past these handbags and not buy one? Or two or three . . . They’re handmade using pieces of old carpeting (or maybe new at times as well). This is my collection. I must admit, I seldom use them, but they look nice as a wall decoration in the hallway! This is, of course, only a small sampling of the marvels of the Vernissage. I have more to show you so we’ll do another trip another time. So where else in the world have you found a great market? And what types of merchandise was/is for sale there? Something gorgeous or fun or weird or scary? What is the most unusual item you’ve ever bought in a market? Or has something interesting happened to you in a market? Make my day and tell me! Hi, I’ve come from BLOGitse’s site so officially we are now on a ‘date’ set up by her! I haven’t anywhere near as much travel experience as you and I’ve never lived out of England, but I’ve been to markets in Bali (I may possibly have been the ample-breasted British woman you refer to in the post above), Moscow, Singapore, and all over Europe. I enjoy buying something ‘typical’, usually handmade, and particularly enjoy collecting Christmas tree decorations this way. But haggling is a problem for us Brits! I can say without a doubt I have never been to a market that sells left over lab chemicals. A bit terrifying. No? The rugs and the pendents and even the ball bearings are beautifully displayed.Thanks for taking us to market with you! What beautiful photos. I want a carpet and purse! I usually go to markets in France for their wonderful display of foods. I love the smell of cheeses and fresh fruits, especially melons and peaches. Here in California, I miss the aromas from France. I’m not a junk collector and have tried to simplify. Less is more, as they say in writing. I was in the market in Kara, Togo one day looking at pagnes. While haggling the price a gecko fell out of the stall roof and down the front of my dress. The market mama’s had so much fun laughing at me jumping up and down and screaming that they threw in a free pagne. I still have that pagne too 🙂 It’s one of many hilarious market stories. Oh what a gorgeous market I love the art and the carvings and the carpets The carpets make me think of the big carpet shops in the bazaar in Marocco I love markets and the huzzle and buzzle of it Here we only had one every week. Now smaller ones are starting up. This is fantastic! How I’d love to visit a market like this. Believe it or not, I’d buy the mechanical thingamabobs and maybe the blue covers over the stalls! You took some fine shops and love the rugs, jewelry, and handbags! I love visiting local markets. Whether it’s INA in Delhi for fresh fruits and veggies or the Masaii Markets in Nairobi. A huge part of the fun is the haggling. One of these days i should blog about the evolution of my haggling style.